When joining the Hilton HHonors Rewards program, you need to keep in mind three things. First of all, you will earn Hilton HHonors points only when you book directly from Hilton. 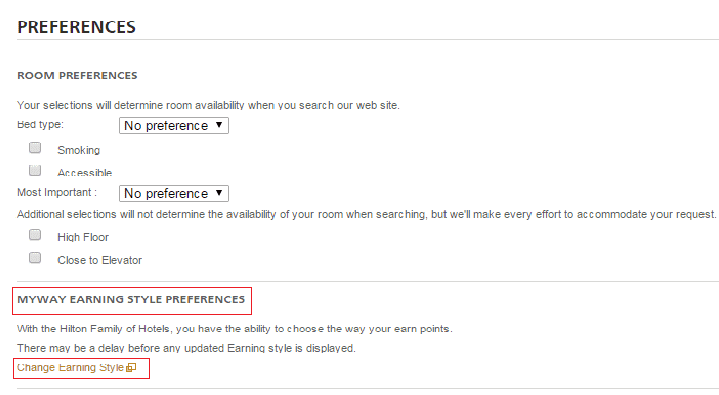 Second, you need to find out how Hilton HHonors points work. The third, you need to understand what “my way earning style” is. You will earn Hilton HHonors points only when you book directly from Hilton. What does that mean? That means only when you book through Hilton.com, Hilton direct booking line, Hilton hotel, you are allowed to earn HHonors points. If you book from online third party travel agency such as expedia.com, booking.com, priceline.com, you are not able to earn rewards points. There are two types of HHonors Points: HHonors Base Points and HHonors Bonus Points. The HHonors base points will count toward your qualification for elite status; the bonus points can only be added to your total points for redemption. 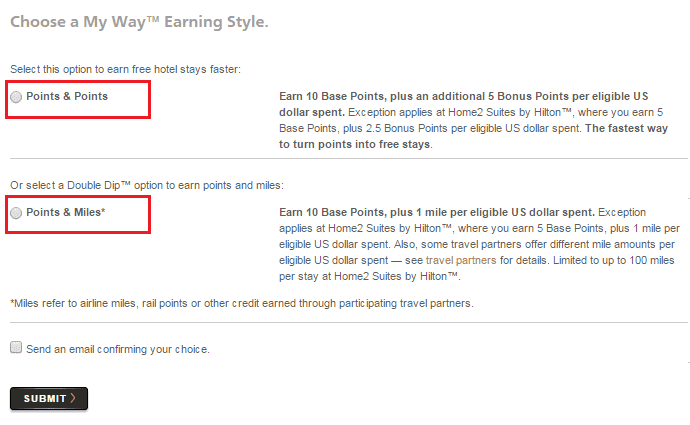 Hilton HHonors offer members two ways to earn rewards: “Points & Points” or “Points & Miles”. When choosing “Points & Points”, you will earn base points plus bonus points on the dollar you spend in Hilton Hotels and if you choose “Points & Miles”, you will earn base points plus miles on the dollar you spend. When enroll the HHonors rewards program, don’t forget to choose either “Points & Points” or “Points & Miles” in “My Way Earning Style Option” in your profile, otherwise, you will lose your bonus points or miles and only earn base points. 1. Enroll to Hilton HHonors – this is easy, just follow the instructions. 4. In “choose a my way earning style” page, you can find there are 2 earning options: points & points, points & miles, choose your preferred option style. If you spend a lot of time in flight, then the Points & Miles Earning Style is right for you. If you want to maximize your points to earn free hotel rewards nights as soon as possible, then you should choose Points & Points as your earning style. You are not able to earn “miles & miles” instead of “points & miles”. However, HHonors points can be transferred to airline miles. Also, you can change your preferred earning method directly in the settings of your Hilton HHonors account any time you change your mind.